The Assembly Ground is the first Food and Beverage outlet opened by Nelson Yap. It is located at level 1 of The Cathay and is an extension of The Assembly Store. The café follows a lifestyle concept, one that provides customers not only delicious food but also offers warm ambience. If you are looking for a place to chill out with friends, you should totally check out this café! The design and layout of the café makes it a really nice place to sit down at and enjoy a cup of coffee. Just basking in the ambience provides a relaxing feel. The fonts of the signboards give off this artistic and elegant vibe. 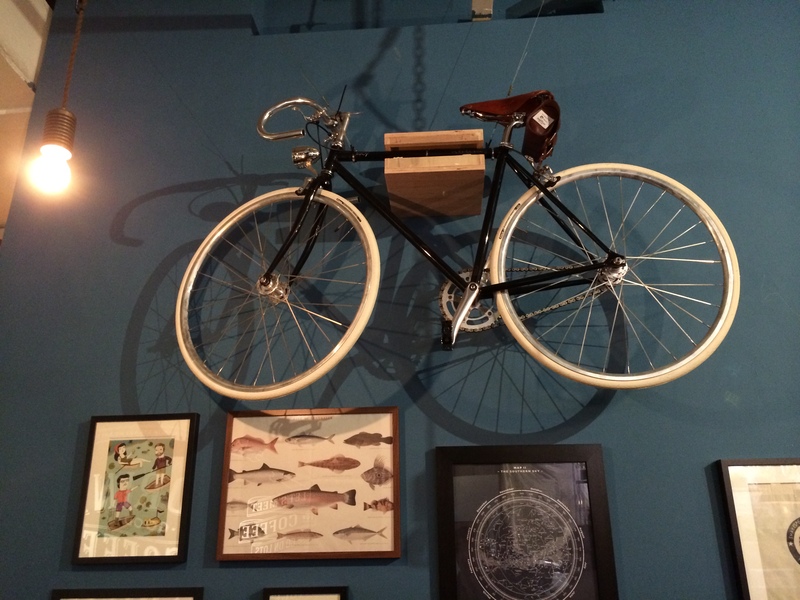 Why are there bicycles hanging on the wall you might wonder? Nelson Yap, founder of the café, specially designed the cafe this way. Bicycles and motorbikes were part of his daily experience in Australia, so he was naturally inclined to use them in the decoration to give a personal touch to it. For the appetizers, we were recommended truffle fries and popcorn chicken. They were tasty and we couldn’t get enough of them. A fan of truffle fries? You have to try this. It doesn’t disappoint. One of the signature dishes for the main is the The Assembly Brunch. As you can tell from the name, this is definitely their specialty. It was a generous proportion that included a combination of scrambled eggs, bacon, wiener sausage, sautéed mushroom, potato gratin, cherry tomatoes and toast. The Assembly Ground’s specialty is its coffee, especially iced coffee. Their iced milk drinks come with ice cream too, making it a treat to enjoy if you have a sweet tooth. We were recommended ice latte for iced coffee and green tea latte for hot coffee. You certainly must try out their coffee. If you are looking for brunch, a good cup of coffee or a place with great ambience to chill out at, come down to The Assembly Ground! Next Post [Commentary] What Will Become of Pink Dot?